It is not UIAA approved, and is not suitable for technical ice climbing, but after some use, I have concluded that this is a terrific axe for snow and low angle glacier travel. I bought this axe in anticipation of a trip to the Bugaboos. Approaches and descents in the Bugs generally require travel over glacial terrain. An axe is needed for self arrest, balance, step cutting, and easy climbing. Having an ice axe that is as light as possible is a benefit because when you’re rock climbing, the axe is just dead weight. After some use and testing in the Bugaboos, and on snow slopes closer to home, here are my thoughts on the TiCa axe. It’t not for long, steep, technical climbing. This seems obvious, but I figured I would state it up front. The axe doesn’t have enough heft to swing all day on steep ice. If you’re climbing something steep enough to require front pointing and it continues for more than 10 or 20 meters, you will probably be better served with a real ice axe. I wouldn’t want to use the TiCa Ice Tool on water ice either, other than just the occasional patch of water ice. It’s just too light to have enough momentum to sink the pick into hard water ice very efficiently. You’re not going to have an easy time using the TiCa to climb out of a deep, overhanging crevasse. However, you really aren’t going to be able to climb out of a deep, overhanging crevasse with only one tool, no matter how technical that tool is. 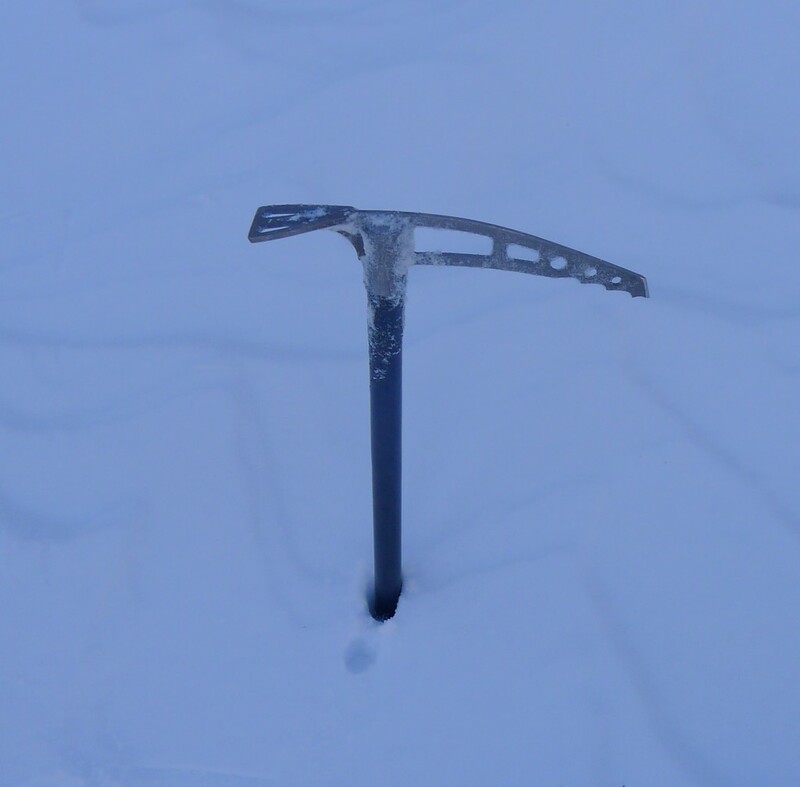 If you’re only carrying a single ice axe, you’re going to need to rely on prussiks to self-rescue anyway, regardless of what sort of axe you’ve got. It’s not safety rated by the UIAA. That means that I can’t really trust it for boot/axe belays or as an anchor when used in a T-Slot. It cuts steps. Before I had the chance to test it out, I wondered if the TiCa axe would be any good at cutting steps. It’s so light that I worried that the axe would not have enough heft to chop steps. As it turns out, it does a pretty good job. Even though it is feather light, all of the weight is concentrated in the head, so the swing weight is pretty good. I cut steps in hard glacial ice in the Bugaboos without any problems, using both the adze and the pick. If you need to cut steps to get you across a patch of steep, icy ground, the TiCa works well. The pick is functional for upward progress and for self arrest. I used the TiCa axe for climbing out of a bergshund, and it worked fine. I played around with it on steep glacier ice, and it works fine. It’s not a technical tool, and as I wrote above, I wouldn’t use the TiCa for long bouts of climbing AI3 or water ice, but for occasional use on steeper ground, it will work. There is no hand rest, and I didn’t use a leash, but the titanium spike on the bottom sticks out a little bit, and this gives you a sufficient grip on the shaft for pulling. The titanium pick bites into ice adequately for decent security using piolet ancre technique. Note that the pick is shipped from the factory un-sharpened. I sharpened it with a file to give it better bite on ice. If you want to use the TiCa for anything other than self arrest, I would recommend that you sharpen the pick. 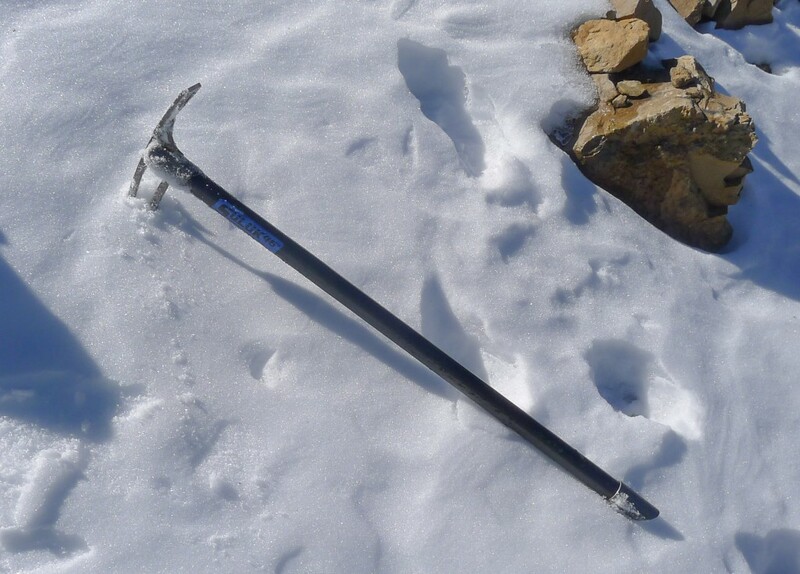 For self arrest, the TiCa works just like any other ice axe. I found it no harder to use than any other mountain axe. The spike on the bottom of the shaft works fine for plunging in snow and softer glacial ice. It’s not particularly sharp, so it’s not as effective on harder ice. Still, I found it adequate for general mountaineering use in piolet canne technique. Overall, the TiCa is something of a niche product. It’s for times when you want something for self arrest, and for negotiating the occasional icy step, but you don’t necessarily need a full on ice axe. Ski mountaineering, easy glacier travel, snowy cols, approaches to alpine rock climbs, and other such situations are where the TiCa axe comes into its own. I think I will be using the TiCa as my go-to axe for non-technical situations. It’s just so light, that I can put up with its other limitations. I wouldn’t recommend it to someone as their only axe, but for times when you just need a very simple ice tool for non-technical climbing, and weight is at a premium, I feel it is a good choice.